Dearborn County retains a diverse mixture of agriculture and industrial enterprises. Its architecture is equally diverse with styles ranging from the Federal and Greek Revival of the early decades of the Nineteenth Century to the Queen Anne and Bungalow of the early Twentieth. Many structures are architecturally and historically significant to Dearborn County and the State of Indiana, and while some are being saved and restored, many still provide great potential for preservation and reuse. The Gateway Dashboard displays summary information about political subdivisions, including revenues, expenditures, and assessed values. 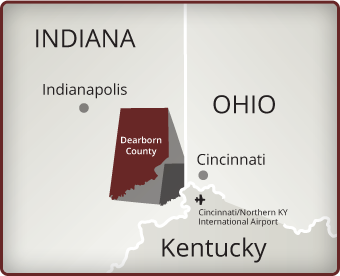 Dearborn County, located in the southeastern-most corner of Indiana, borders Ohio & Kentucky. Quick access to major Interstate arteries, 20 minutes from Greater Cincinnati Airport and 90 minutes to Indianapolis Airport. 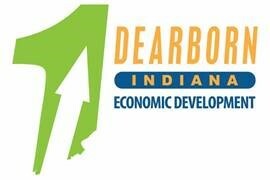 Follow the link (via logo to left) to our Economic Development website to find out why businesses are choosing Dearborn County, Indiana to locate and expand existing operations!